I discovered Sabon about five years ago while aimlessly wandering the streets of NY. I was coaxed in by the beautiful smells and the floor to ceiling wood paneling filled with artisan soaps, body butters, and fragrances. I was invited to stay by the store clerks who guided me to the trademark stone sink in the middle of the store where they exfoliate, wash, and moisturize customer’s hands with a variety of sumptuous products. 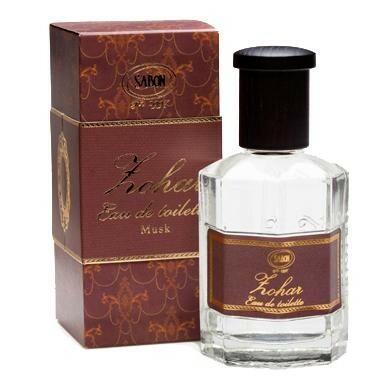 My first time in Sabon I tried a daily perfume called Zohar, a musk fragrance. If you know anything about musk, you know that the fragrance can be hit or miss. But the store clerk encouraged me to try it out for the day and see how I liked it. After an entire day with it just spritzed on my wrists, I loved it. It was fresh and persisted through the heat of a NY summer without ever faltering. A few days later I returned to the store and bought a bottle of Zohar. Since then I have regularly ordered Zohar online or visited the store in NY if I’m in the area, but for the last six months or so, Zohar has been out of stock online. I was in NY a few weeks ago so I figured I’d visit the store and buy a bottle as I had in times past, but such was not the case. “We haven’t had any shipments come to the store in about six months,” the store clerk said. “Six months? !” I responded in exasperation. A first world dilemma was upon me for I was about to be without my favorite fragrance for an indefinite period of time. She told me to put my name on the waiting list and she would let me know when it came back in stock. That store was at 70th & Broadway and I walked down to the 57th and 6th Avenue location to see if I would be met by the same fragrance-less fate. I was. “We haven’t had it for a long time, matter of fact, we haven’t had any perfumes for a long time.” At this point I had to ask, “Why?” The store clerk told me that the fragrance ships directly from Israel and sometimes the shipment gets held up in barrels at customs. My mind flashed back to the boxes the perfume comes in and the writing that indicates the manufacturer location in both English and Hebrew characters. Of course. Why didn’t I think about that? Who has time to deal with your exports when you are in the midst of a crisis such as is occurring now? Then the reality set in. It’s made in Israel. What then is my ethical responsibility? Do I continue to patronize Sabon assuming it means nothing in the grand scheme of things? Or do I stop patronizing Sabon until there is a lasting end of the violence and a return of the land to Palestinians–or an agreement to the two-state solution? Some might think these are big questions to pose over a little bottle of perfume but, to me, they are important to how I place my stake in the sand on this issue and they stem from a longer personal connection with the region. In the summer of 2012 I traveled to the Middle East as part of a travel seminar for seminary students and lay leaders. We traveled to Jordan, the Sinai-region of Egypt, Israel, and Greece. 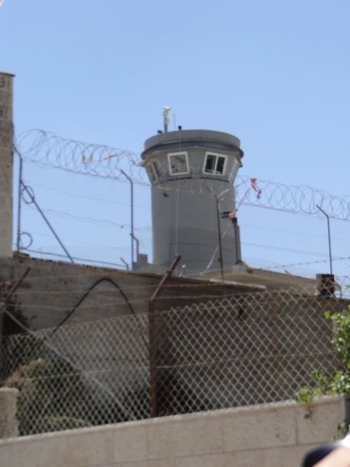 During that trip we went to the West Bank along the barrier that separates Israelis from Palestinians. As our guide told us, Palestinians are shuffled through the barrier like cattle, sometimes people are arrested, and all the time Palestinian people are made to feel less than human so that the Israelis can maintain their sense of peace and security during the occupation. Hearing the stories about how people’s houses are demolished on a moment’s notice–and within moments of that destruction they are given bills to pay for a destruction they didn’t order, seeing the barriers and the water towers that are controlled by Israelis, and the graffiti painted on the walls with outcries for return, redemption, and a sense of freedom, it was hard for me not to choose a side. After all, I’m a black person in America who isn’t too far removed from the enslavement of my ancestors and the daily systematic oppression of darker people. I say this not to compare the struggles but to make an empathic connection. I know it’s not a black and white issue–in terms of simply marking one side good and the other bad–but I can’t ignore the overwhelming power one side has over the other and the ways in which that power usurps one very important dynamic, love. 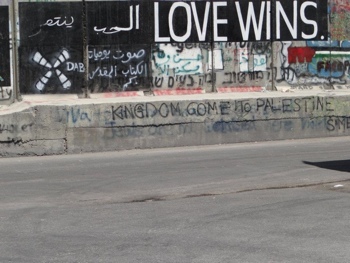 This picture has been my Facebook cover photo for the last two years because it represents the one thing the IP conflict and the world needs, love. I don’t care how cliche it sounds, it’s true. You can’t say that the Israel, a nation of people who live under the belief that they are God’s chosen people, are acting out of love. How does love order the destruction of people’s homes, kill women and children and hundreds of civilians, and cling to selfish desires? How does love see violent retaliation as a reasonable response without recalling that an eye for an eye leaves everyone blind? Love is missing. Love of the land which would require gracious stewardship and sharing. Love of humanity which would demand an interest in the preservation of lives in general but especially those of children, our future. I see love missing on both sides even though I am also clear about the position that I am taking. I have a heart for Palestine–DO NOT READ THIS AS “I HAVE A HEART FOR HAMAS.” I take seriously what it means to speak of this conflict as a “humanitarian crisis” and watch the bodies–largely Palestinian and children–pile up. As a Christian I can’t idly stand by and say I believe in what or how Israel is fighting to not share land. I won’t be scared into the silence that many have taken up on this matter. I’ve seen too many Christians and people of color stay silent when they have more in common with Palestinians than not. I know no one wants to take sides because people are scared or they feel they don’t now enough about the conflict but I implore everyone to arm themselves with wisdom, knowledge, and most importantly, love. Maybe the loving way is not to choose a side–or to stop buying perfume–but it is to do more than sit idly while lives are being taken and communities are being destroyed on the daily. And this brings me to my concluding point, the point that started all of this.